By andyjones in Bechstein update on Apr 17 . 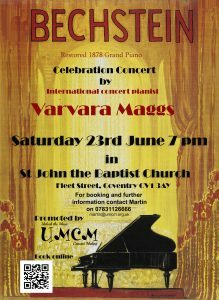 Poster for the concert, designed by Martin and Kevin. New in – this poster from the concert, designed by Martin and Kevin from an original by Bechstein dated 1920. This is close to being the finished article for our promotion. Martin is also working hard on the programme and this is looking great too. We’re now selling tickets on EventBrite.